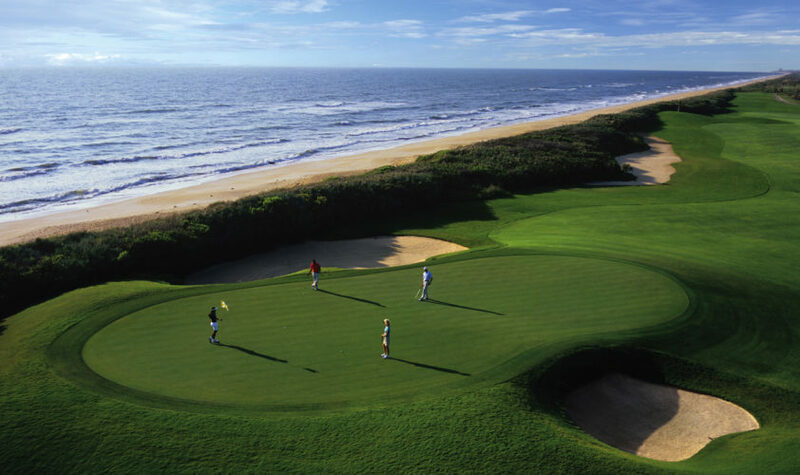 PALM COAST, Florida – In 2016 one golf publication rated the Ocean Course at Hammock Beach Resort as number 10 on its list of Best Courses You Can Play. And then, suddenly, you couldn’t. That same year Hurricane Matthew savagely walloped Haiti, Cuba, the Bahamas and the eastern seaboard, in its wake leaving more than 600 dead and damage in the billions of dollars. Golf was just another casualty, far down the list amid such devastation, but the loss was real. At the Jack Nicklaus-designed Ocean Course, the hurricane’s high winds caused a storm surge that flooded the course with saltwater that killed grass, damaged tees and bunkers and more. Owners took what they called the long view, closing the course for a complete restoration that would include regrassing with salt-tolerant Platinum Paspalum and rebuilt tees, bunkers and greens. In 2017 Hurricane Irma arrived but the new grass held up and the golf course reopened in November with a ceremonial first foursome that included PGA legend Lee Elder and tennis great Ivan Lendl. The 17th hole on the Jack Nicklaus-designed Ocean Course at Hammock Bay Resort. Top: The Ocean Course’s picturesque ninth hole. In two past visits wind and rain dashed my plans to play the Ocean Course, but this spring I stood on the first tee on a day that was windy but otherwise gorgeous. In the distance, missing roofs on large condo buildings still displayed evidence of Irma’s wrath, but the golf course was indeed back in all its green grass and white sand glory and all the more beautiful for its magnificent blue ocean views. Again, it’s a course you can play – maybe even should. And it’s far from the only one in this northeast corner of Florida. On that note, some geography. Palm Coast — not to be confused with Palm Beach, though when I tell friends where I go they often do confuse the two — is midway between St. Augustine and Daytona Beach in Flagler County. Flagler County, the Flagler beaches, Flagler Hospital and Flagler College in St. Augustine are all named for Henry Flagler, an industrialist and a founder of Standard Oil who was instrumental in hotel and railroad development in early Florida. The vibe here — with 19 miles of beaches, extensive hiking and biking trails, nature preserves, fishing and paddling — is decidedly less hectic and crowded than some other parts of Florida. (On several occasions when I perhaps indelicately referred to it as “less crazy” than other areas, residents nonetheless nodded agreement.) Add in oceanside dining spots, the family-friendly Marineland Dolphin Adventure and more than a few worthy historic sites — beginning with St. Augustine, America’s oldest city — and it all adds up to a place winter-weary Midwesterners will embrace. For golfers, the allure is a shiny bright as a brand new Titleist. The umbrella group Florida’s First Coast of Golf lists dozens of courses from Amelia Island on the north to Palm Coast and Flagler Beach to the south, a region that includes golf-rich Jacksonville, St. Augustine and Ponte Vedra Beach, home of the famous — or infamous, if you are on the tee of the knee-knocking par 3 17th with its hit-or-go swimming island green — Players Stadium Course at TPC Sawgrass. 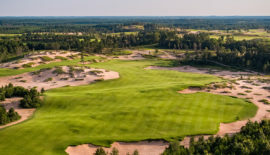 Golf magazine has called the Pete Dye-designed Players one of the 50 best courses in the world, and it is certainly among the best-known challenges in the game. Also in Ponte Vedra Beach is Dye’s Valley Course, which has hosted a number of tournaments through the years including the Senior Player Championship, the Cadillac NFL Golf Classic and the United Van Lines Aces Challenge. You don’t need Gary Player television commercials — though if you watch golf how do you miss them? 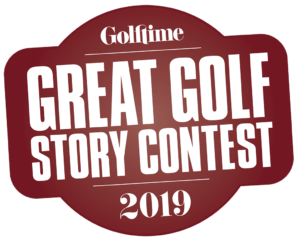 — to know that the World Golf Hall of Fame, eight miles north of St. Augustine on International Golf Parkway, is a place every golfer should see. And having visited it on two occasions, I would agree, and allow enough time to view the amazing memorabilia of Hall of Famers have donated to the member locker room, absorb five centuries of golf lore revealed in the hall’s permanent and traveling exhibits and to stroll across a life-size replica of the Swilcan Burn Bridge from the Old Course at St. Andrews. And bring an extra credit card — the PGA Tour Superstore has more temptations for golfers than any sailor ever encountered on shore leave. Top left: The PGA Tour Academy at World Golf Village offers personal instruction. Top right: The World Golf Hall of Fame is a must to visit. 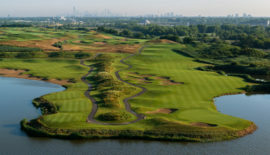 Below, at left: The Slammer & Squire course designed by Bobby Weed with an assist from Sam Snead and Gene Sarazen. Bottom right: The King & Bear course — the only course designed by Arnold Palmer and Jack Nicklaus. Of course, there is also playable golf at World Golf Village, with two notable tests of the game. The King & Bear is the only golf course co-designed by Arnold Palmer and Jack Nicklaus, boasting two nines of varying styles. 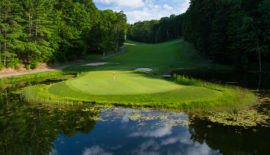 The front nine is a more open, links-style stretch of golf, while the back features many tall pines and spreading oaks. The second course is the Slammer & Squire, designed by architect Bobby Weed along with Sam Snead and Gene Sarazen. 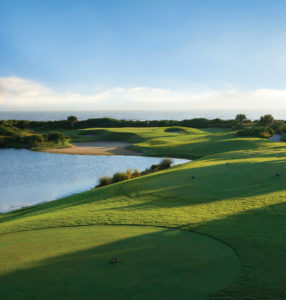 In addition to the Ocean Course, Hammock Dunes Resort is also the home of the Tom Watson-designed Conservatory Course, where highlights include “waterfalls, babbling brooks and veneered field stonework.” Watson was not shy when it came to hazards, sprinkling the course with 140 sand and coquina bunkers and even three sod-faced bunkers to pay homage to the British courses he so loves. Speaking of hazards, with so many golf courses in close proximity a visiting player must be careful with names. I arrived at St. Johns Golf & Country Club near St. Augustine for a scheduled round and even had my clubs on a cart before I learned my tee time was actually at St. Johns Golf Club about 20 minutes away in Elkton. But no problem. I arrived in time at the 18-hole public course that bills itself as friendly to both visitors and, because it is relatively flat, to walking golfers as well. Strong winds added challenges the course designer had not but all in all it was a fun round of golf. Another day it was not wind but thunder, approaching lightning and a tornado watch that ended a planned round at Plantation Bay Golf & Country Club in Ormond Beach after just one hole. (I made par on the opening hole, though, so for once in my life can claim to have played in level par.) A residential community, Plantation Bay offers 45 holes of golf, and while I played only the one on my first visit we stopped for a quick nine on our day of departure and left wishing we’d had time for more. For those who don’t always shoot level par, golf instruction is available at either the PGA Tour Academy at World Golf Village, a full-service teaching facility, or the Golf Made Simple program at Hammock Beach Resort. There is much to do in the Palm Coast area than just golf, hard as that may be to imagine. An hour to the north is Jacksonville, the largest city in Florida in terms of both population and land size, where visitors will find a vibrant riverside district, downtown theaters, a zoo and the home of the Jacksonville Jaguars. Orlando, with its world-famous Walt Disney World and other family-luring theme parks, is just 90 minutes to the west. St. Augustine’s historical sites are well worth taking in, whether on foot or by horse-drawn carriage rides. Flagler College, set in the “gilded age palace” that once was Henry Flagler’s Hotel Ponce de Leon, has been called one of America’s most beautiful college, and visitors shouldn’t miss Fort Matanzas National Monument, a fort that dates to the 17th century. Also just 30 miles away, Daytona Beach is home to both the Daytona 500 and the LPGA. Visitors can tour the World Center of Racing at Daytona International Speedway, take in the Museum of Arts and Sciences or climb the second tallest lighthouse in Florida. For more on Palm Coast and Flagler County, visit www.visitflagler.com. 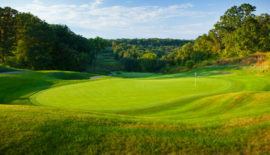 For information on golf courses, packages or golf instruction, visit www.florida-golf.org.